The original protected bike lane segment was adjacent to the sidewalk on the left side of 15th Street. The new temporary section, still under construction, is on the right side. 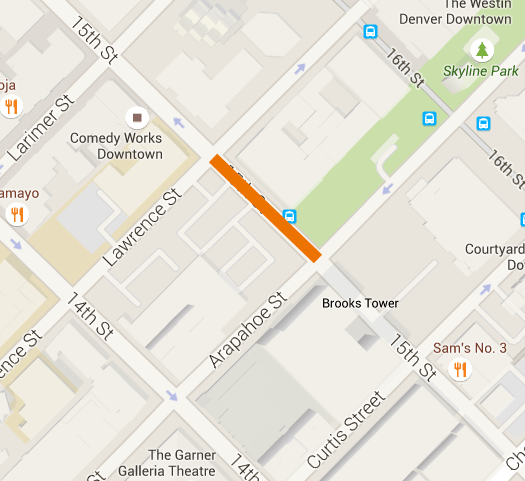 Get ready for a change to the 15th Street bike lane on the one-block stretch between Arapahoe and Lawrence streets. Developers are building a 40-story office building, and the construction crew needs the right of way to build what will become Denver’s fourth tallest skyscraper. The Department of Public Works will move the bike lane to the right, but maintain its “protected” status with jersey barriers — bright yellow concrete blockades — along the left side, and bollards on the traffic side. DPW also will paint green markings in mixing zones where drivers might encroach on bike riders. Riders may have noticed yesterday that a re-striping of the lane forced riders to the right, toward traffic, with no physical barrier. The merge was not pleasant, or safe. But that should change after DPW finishes its work today or tomorrow. The 9-foot temporary bike lane should actually feel wider than the permanent one, which has a slope for drainage that renders two feet of the space unusable. So bike riders will benefit with a bigger buffer — at least for one block. Meanwhile, that segment of 15th Street will get a temporary 30-month road diet, shrinking from four travel lanes to three. The striped bike lanes on Arapahoe and Lawrence will be impacted by the construction, but also maintained, according to DPW. 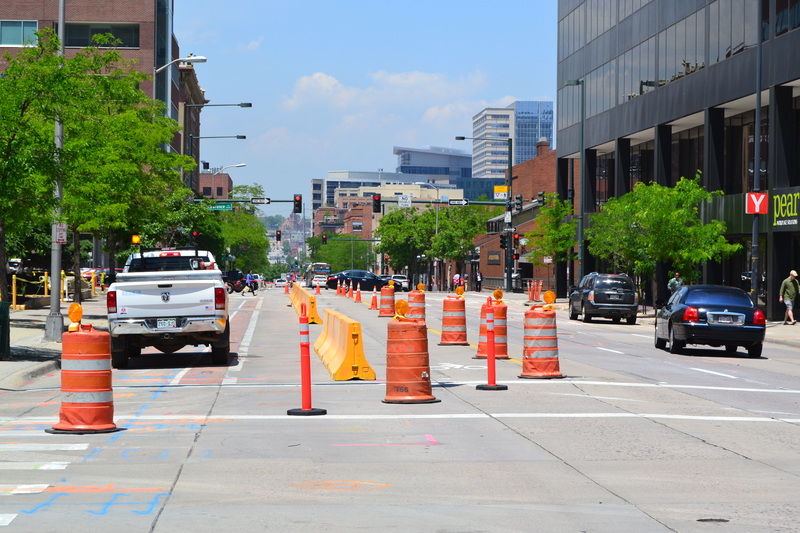 They’re on pace to become the city’s next two protected bike lanes this summer or fall, and BikeDenver’s Molly North said she expects them to remain that way throughout construction. “We’re glad to see the city is maintaining the protected bike lane during this construction and we would like to see a similar accommodation when the Lawrence and Arapahoe protected lanes are installed,” North said. Construction crews will break ground on the skyscraper Tuesday. We’re interested to know how the construction affects your ride — particularly how safe it is to transition between the original lane and the temporary one. Let Streetsblog Denver know how it’s going by getting in touch with us via Twitter, Facebook, or email. Its not an accommodation, its a safety plan. Dont let the city think theyre doing us a favor, make them realize theyre providing the minimum necessary safety measures needed to reroute traffic around construction.